Very very excited about some lovely spindles that arrived this week from the same maker who makes these polished ebony and rosewood hooks and needles . I only have a couple of samples, but they're so gorgeous I hope to have lots in stock soon. Back to the story of that fibre. When I opened the box and saw those spindles and desperate to try one, I got straight onto the drum carder. It's been a long time since I made some sample fabric for the curtains in my freshly-decorated bathroom. 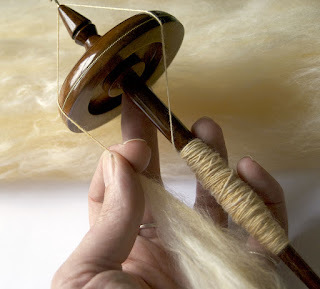 I have been thinking that it would be even nicer to spin the wool / silk mix with a drop spindle. 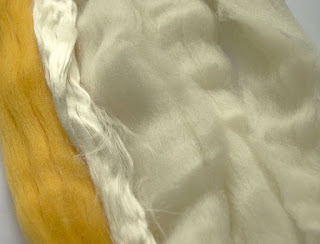 This is the mix - 3 parts white merino, 1 part dyed 'cheesecake' merino and a little silk. It feels very good to be using a spindle again, I'll enjoy spinning this blend for my curtains. 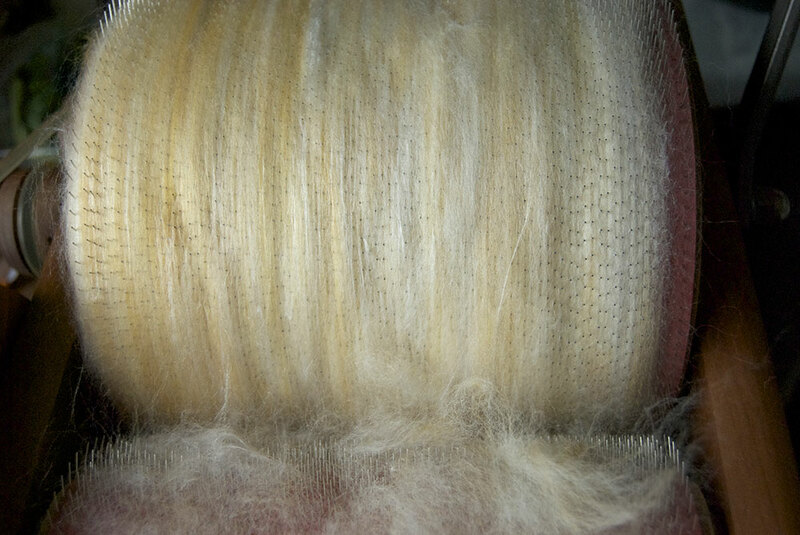 As per the sample I made, the fabric will be woven using cottolin as the warp and this wool/silk mix as singles for the weft. Your comments make ne think I maybe need a packer brush ... must go and check your videao, see how I feel about it now I've a bit of experience with a drum carder. I think I made my video before I started using one, Elen, but you can see the effect of one for yourself by using a wallpaper / decorating brush or a very wide paintbrush held in the appropriate position (you'll need 4 hands or a willing volunteer).